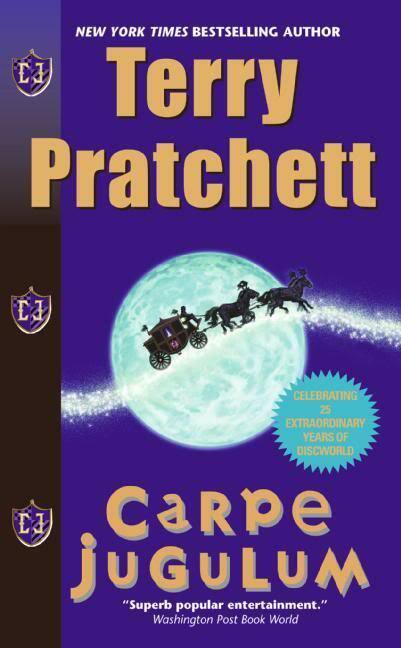 This isn’t just my favourite Pratchett book; this is one of my all-time favourite books. One of the books that will make the list if someone asks me for my Top Five. 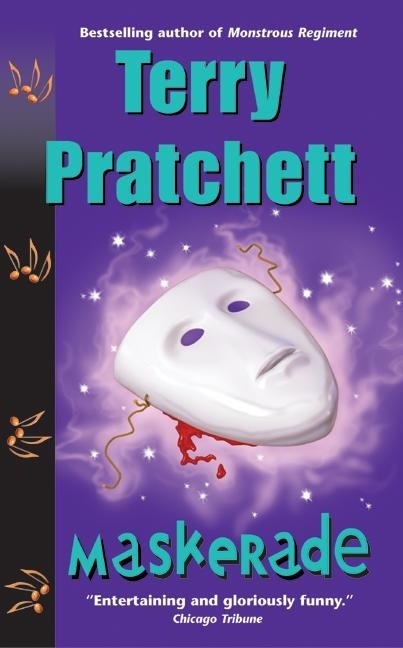 Like Wyrd Sisters, Lords and Ladies spirals around a Shakespearean plot, although considerably more loosely than Wyrd Sisters does (there are, however, subtler quotes peppered in all over the place, which is a delight to as thorough a Shakespeare geek as I am). At the essence of it, though, we have fairies, and a wedding: Magrat “wet hen” Garlick is about to marry King Verence II, lately of the Fool’s Guild. Verence has determined to be the best king he can, based largely on advice out of books he’s had sent from Ankh-Morpork. His efforts are continually frustrated by his citizenry, who don’t think a king has any business telling them how to farm since they don’t tell him how to king, and who are so vehemently anti-democracy that they’ve opposed all his efforts at instilling a more egalitarian form of parliamentary government on them. Magrat is caught between witch and queen (aware that she can’t be both unless she’s willing to go the route of behaving wickedly and wearing low-cut gowns), and is fed up with Esme and Gytha acting like queen is second-best option. 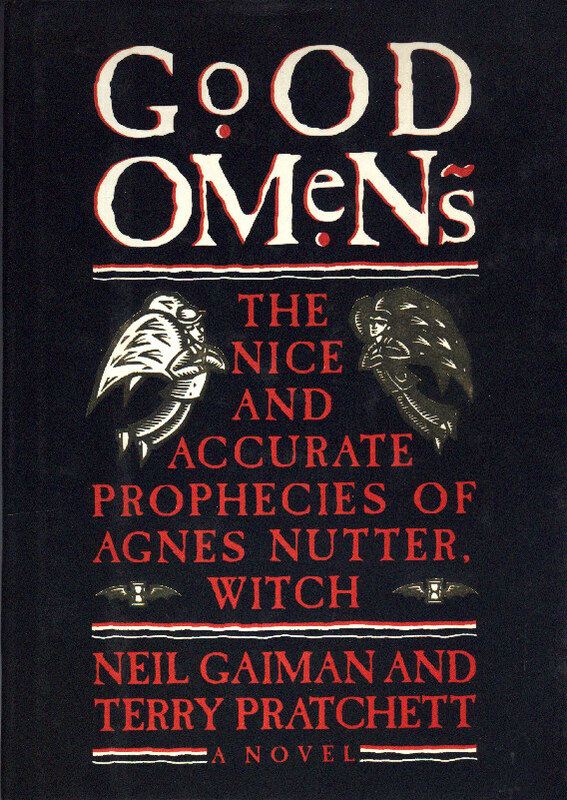 Esme and Gytha, meanwhile, are dealing with some young upstart witches — one of my favourite bits of satire in the book. Whereas Magrat is clearly inspired by New-Age-y, hippie type witches, what with the flowy garments and Eastern influences, the younger set — Diamanda (nee Lucy), Perdita (nee Agnes), Magenta (nee Violet), and the rest — are clearly inspired by the more recent Goth-type witches. I know what it’s like to be young and foolish, and while I flatter myself I was never quite so arrogantly obtuse as Diamanda, well, maturity’s memory does tend to gloss over the more shameful elements of years’ past. At any rate, reading about these girls is utterly satisfying, both as someone who has no patience with that sort of nonsense now and as someone who still retains a touch of nostalgia for that irreplicable feeling of being so young and so sure. 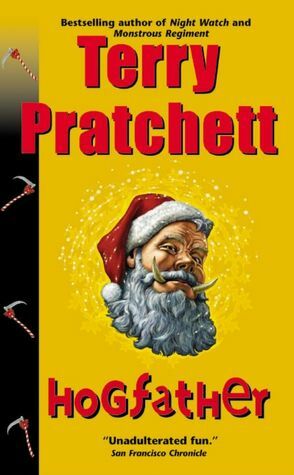 It’s probably because Pratchett handles it so well, as he always did with Magrat’s brand of lunacy — it might be ridiculous and ludicrous, yes, of course, but it isn’t mocked in a truly cruel way. There’s still an indication that it either comes from the heart, from some place of purity (in Magrat’s case), or that it at least comes from a combination of youthful indiscretion and the near-painful imperative to know who you are and what you want to make of yourself, which may lead down absurd paths and rightfully earn some gentle ridicule, but which can’t be condemned, all the same, because we’ve all been there. I can laugh at Diamanda and Perdita and Amanita because I am, at least a little bit, laughing at myself, ten or twelve years ago. Unfortunately, Diamanda’s wounded pride gets the better of her after she loses a witching contest against Esme, and she does something truly foolish — something that opens Lancre up to a fairy invasion. And now we get to what I really love about this book. This book treats the Fae properly. Which is to say, as terrifying creatures who are the reason iron horseshoes are considered lucky, because we once needed it to protect us; as hypnotizing, merciless, pitiless, and unfeeling; as dangerous and carelessly destructive, thieves of children, slayers of cattle, ruiners of crops, who steal everything and leave nothing and take and take and take; as the dark truths behind a hundred nursery rhymes where, as Pratchett puts it, protective charms and cautionary warnings are passed down “from grandmother to grandchild in little bits of nonsense they won’t bother to forget.” In a way, the book is a nice satire of the transformation the Fae have undergone in the last two hundred years or so. The Victorians and Edwardians turned them nice, turned them into cute little things who grace stationary and can be portrayed delicately in watercolours. I don’t know whether I blame James Barry or the pre-Raphaelite painters more. It’s starting to swing back the other way, though (thanks in part to this book and to Neil Gaiman’s Stardust and Sandman), and the darker interpretation makes for much more interesting stories. A lot of those nursery rhymes and poems find their way, explicitly or not, into the story — the ballad of Tam Lin, Thomas the Rhymer, Arthurian legends, Cornish prayers. (I refer my Gentle Readers once again to the L-Space if you need a cheat sheet). There are indeed such things as parallel universes, although parallel is hardly the right word — universes swoop and spiral around one another like some mad weaving machine or a squadron of Yossarians with middle-ear trouble. And they branch. But, and this is important, not all the time. The universe doesn’t much care if you tread on a butterfly. There are plenty more butterflies. Gods might note the fall of a sparrow but they don’t make any effort to catch them. Shoot the dictator and prevent the war? But the dictator is merely the tip of the whole festering boil of societal pus from which dictators emerge; shoot one, and there’ll be another one along in a minute. Shoot him too? Why not shoot everyone and invade Poland? In fifty years’, thirty years’, ten years’ time the world will be very nearly back on its old course. History always has a great weight of inertia. At circle time, when the walls between this and that are thinner, when there are all sorts of strange leakages… Ah, then choices are made, then the universe can be sent careening down a different leg of the well-known Trousers of Time. I’ve taken to using the Trousers of Time metaphor when discussing this sort of thing, and it either goes over quite well or like a lead balloon depending entirely on how willing my conversational partner is to accept my madness and move along. I do feel rather like Gytha pausing to explain the essential fractal nature of reality. 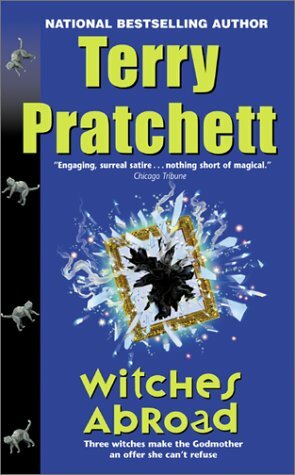 The wizards of Unseen University make an appearance in this book as well, and we find out some interesting details about the youth of Mustrum Ridcully, and that of Esme Weatherwax. We get some great jokes about quantum mechanics and the perils of discussing physics in a world that hasn’t quite invented it yet. We also get to see the magic of witches contrasted with that of wizards, with the note that everyone may be right all at the same time (because that’s the thing about quantum). We get more of the normal folk of Lancre: from Jason Ogg and his artisan brethren (even if they don’t what an artisan is, much less a rude mechanical), a group of morris dancers prepping a play for the royal wedding (and under no circumstances performing the infamous Stick and Bucket dance); Hodgesarrgh, the falconer whose birds are only adept at maiming him; a cook who doesn’t believe in vitamins; a beekeeper whose trade involves such deep mysteries that he doesn’t feel the need to bow to royalty; a darling chambermaid named Millie with a tendency to bob and mumble. In addition, Jason gets visited by Death, not for the usual reason, but to shoe his horse, Binky — because Jason is the smith of Lancre, and the smith of Lancre can shoe anything, thanks to mysteries passed down to him. (There are a lot of trade mysteries in this book, come to think of it — it’s one of the subtler themes that can get a little lost under the fairy muddle, but there’s definitely quite a lot about the value of collective and hereditary knowledge). All these disparate pieces weave together so beautifully that you hardly notice until they’ve collided into each other in perfect orchestration. Lords and Ladies is, apart from hitting so many of my favourite buttons, one of the more beautifully constructed books I’ve ever read — mostly because you don’t even think about how beautifully constructed it is unless you really pause to step back from it and consider. 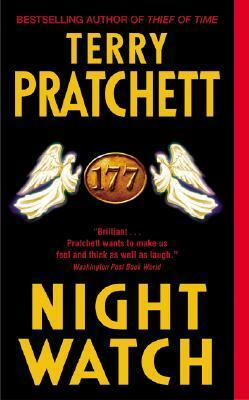 It isn’t one of those books that hits you over the head with how precise and meaningful its arrangement is. It slides right by your conscious brain and into your background awareness. But normal directions don’t work in the multiverse, which has far too many dimensions for anyone to find their way. So new ones have to be invented so that the way can be found. Like: East of the Sun, West of the Moon. Or: Behind the North Wind. Or: At the Back of Beyond. Or: There and Back Again. Or: Beyond the Fields We Know. And sometimes there’s a short cut. A door or a gate. Some standing stones, a tree cleft by lightning, a filing cabinet. A place where there is very nearly here. Nearly, but not quite. There’s enough leakage to make pendulums swing and psychics get very nasty headaches, to give a house a reputation for being haunted, to make the occasional pot hurl across the room. So. I love this book. 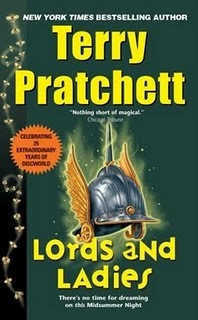 If you read only one Pratchett book ever, read this one. If you read only one book about fairies ever, read this one. If you read only one book I recommend, read this one. It’s a masterpiece.